Typewritten Letter Signed, four pages, small quarto, October 26, 1956. On her name imprinted stationery, 211 East 62nd Street, New York, 21, N.Y., to “My dear Friend”. With several corrections in her own hand. “I was very sorry to get your letter and also sorry to see your statement in the paper. I feel it was a mistake for Mr. Stevenson or Mr. Finletter not to have explained to you long ago what they were actually proposing, as you have evidently accepted the Republican interpretation of Mr. Stevenson’s suggestion. I grant you his first speech was not sufficiently explanatory but since then he has made very clear what he is trying to do and more than 270 scientists have agreed with his position. “The administration tries to say that tests on the H-Bomb must go on or we would be set back two years should the Soviets decide to have the tests after agreeing not to. They also say that after all they have been working patiently to abolish all nuclear weapons and the only real way to have safety is through disarmament with inspection. I will agree entirely on this and so would Mr. Stevenson. This is the ultimate goal but we need badly a gesture to gain the confidence of countries of the world who can’t possibly afford a war, since it now appears that we are always saying ‘NO’ and the Soviets are always making proposals which we are obliged to refuse. “The H-Bomb is apparently the bomb that the scientists feel is the greatest menace to mankind and at the same time the explosion of this bomb is the one thing so far we have always been able to detect. The administration says that it is possible the Soviets may find some place in central Siberia where they can make explosions without our knowing about it, the Soviets could, on the other hand, be saying we may find such a place also. 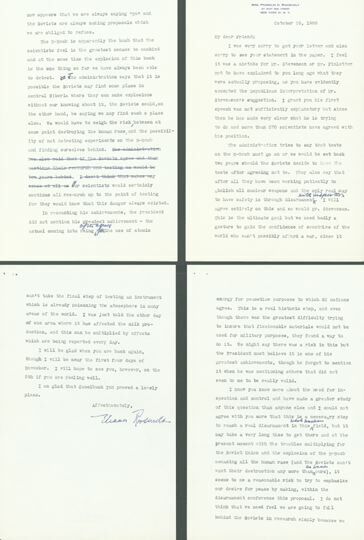 We would have to weigh the risk, between at some point destroying the human race, and the possibility of not detecting experiments on the H-Bomb and finding ourselves behind.” Mrs. Roosvelt crosses out the next two sentences: “The administration has also said that if the Soviets agree and then continue their research and testing we would be two years behind. I don’t think that makes any sense at all”. She continues, “Our scientists would certainly continue all research up to the point of testing for they would know that this danger always existed. In recounting his achievements, the president did not mention his greatest achievement – the actual coming into being of the…for the use of atomic energy for peacetime purposes to which 82 nations agree. This is a real historic step, and even though there was the greatest difficulty trying to insure that fissionable materials would not be used for military purposes, they found a way to do it. We might say there was a risk in this but the President must believe it is one of his greatest achievements, though he forgot to mention it when he was mentioning others that did not seem to me to be really wild. 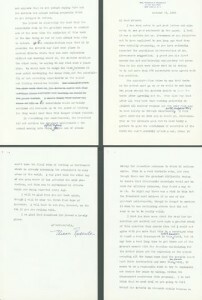 “I know you know more about the need for inspection and control and have made a greater study of this question than anyone else and I could not agree with you more that this is a necessary step to reach a real disarmament in this…nuclear field, but it may take a very long time to get there and at the present moment with the troubles multiplying for the Soviet Union and the explosion of the H-Bomb menacing all the human race (and the Soviets can’t want they destruction any more than we want ours), it seems to me a reasonable risk to try to emphasize our desire for peace by making, within the disarmament conference this proposal. I do not think that we need feel we are going to fall behind the Soviets in research simply because we can’t take the final step of testing an instrument which is already poisoning the atmosphere in many areas of the world. I was just told the other day of one area where it has affected the milk production, and this can be multiplied by effects which are being reported every day. “I will be glad when you are back again, though I will be away the first four days of November. I will hope to see you, however, on the 5th if you are feeling well.